Retired September 1, 1946. Died July 24, 1972. 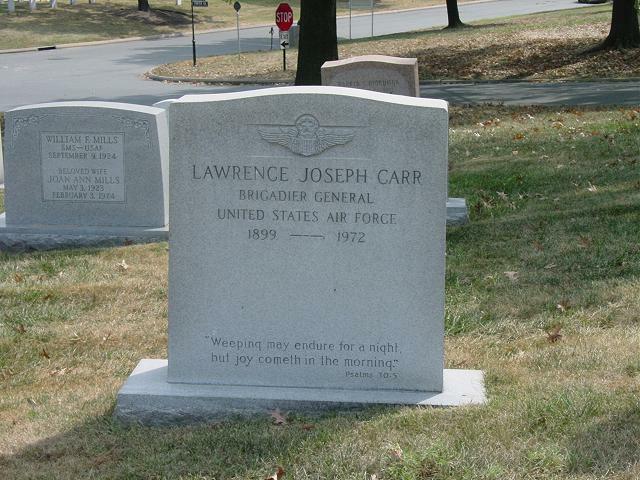 Lawrence J. Carr was born in Chicago, Illinois, on April 8, 1899. He served as a Seaman second class in the United States Naval Reserve from April 29 to July 6, 1918, at which time he was appointed to the United States Military Academy. Upon his graduation on July 2, 1920, he was commissioned a Second Lieutenant of Cavalry in the Regular Army. He first became a student at the Cavalry School, Fort Riley, Kansas, and upon completion of the basic course was assigned to Camp Henry J. Jones, Arizona, as Platoon Commander with the 1st Cavalry. In December 1921 he entered the Flying and Ground School at Carlstrom Field, Florida, and after completing his studies theRe was enrolled in the Air Service Primary Flying School at the same station. In July 1922 he was transferred to Kelly Field, Texas, where he remained approximately four years, first as a student at the Air Service Advanced Flying School, and later as Squadron Operations Officer and Engineer Officer, 8th Attack Squadron, and as Flying Instructor at the Air Service Advanced Flying School, 10th School Group. In September 1925 he was ordered to Camp Nichols, Philippine Islands, for duty with the 28th Bombardment Squadron, and transferred to Clark Field, Philippine Islands, in May 1928. He served there at Camp Stotsenburg until February 1929 as Engineer, Transportation, Education and Recreation Officer of the 3rd Pursuit Squadron. He then returned to the Advanced Flying School at Kelly Field, Texas, to become Instructor of the Attack and Pursuit Section and Squadron Operations Officer of the 41st School Squadron. In February 1932 he was assigned to command the Frontier Defense Unit, Bolling Field, D.C., and in October 1933 became an Instructor of the 8th Pursuit Group at Langley Field, Virginia. In July 1934 he was assigned to assist the Navigation Officer and serve as Intelligence Officer with the Alaskan Flight at March Field, California. In March 1935 he became Assistant to the Chief of the Training and Operations Division, Office of the Chief of Air Staff, Washington, D.C., and in August 1935 he was enrolled as a student at the Air Corps Tactical School, Maxwell field, Alabama. In August 1937 he entered Command and General Staff School, Fort Leavenworth, Kansas. Upon completion of his course the following June, he returned to his assignment with the Air Staff. Ordered to Chanute Field, Illinois, in March 1941, he served as Assistant Executive of the Air Corps Technical Training Command until transferring to the Army Air Forces Technical Training Command at Tulsa, Okla., as acting and, later, Chief of Staff. Early in 1942 he was transferred in the same capacity to Knollwood Field, N.C. In July 1942 he assumed command of Boca Raton Field, Florida, and later became Director of Training Aids at the Army Air Forces School of Applied Tactics, Orlando, Florida, and New York City. In September 1943 he was sent overseas for duty as Deputy Chief of Staff of the Seventh Air Force in the Central Pacific Area, and later served as Chief of Staff of the Forward Area Command. In December 1944 he became Commanding Officer of the 7th Bomber Command, Seventh Air Force, in the Pacific Ocean Area. He returned to the United States in October 1945 for hospitalization at the Army Air Forces Regional Hospital, Mitchell Field, New York. Promoted to brigadier general (temporary) on June 7, 1945.